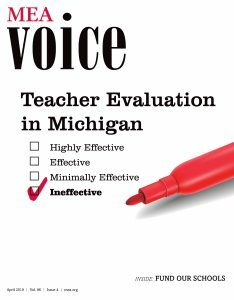 A recent survey of nearly 17,000 educators by Launch Michigan — a coalition of education, labor, business and philanthropic organizations — found only a third of teachers believe the evaluations they receive improve teaching and learning. Fewer than half think the system is fair. These attitudes stem from changes made in 2011 and 2015 that increase the role of student test data in evaluations, ban educators from negotiating about the system used in their district, and tie personnel decisions to evaluation ratings. Talk with teachers and they will tell you of the “Hunger Games” atmosphere created by the high-stakes system pitting educators against each other. Too many report the system has reduced collaboration, which is essential to helping students succeed.